We all love to talk about our guitars. And one of the favourite talking points is "what's it made of?" We attribute near-magical properties to those slabs of old rosewood that make up the body of an old Martin, or the chunk of mahogany underpinning the tone of a golden era Gibson, but what of that is real and what is hype? I can't really answer that, but I can show you a little about what my own guitars are made of (hype is entirely up to you). This will be the first entry in a series about the woods I use. I'll be showcasing the trees that grow around here and provide the local, sustainable timber that I prefer to use whenever possible. Some will be obscure, gems growing in plain sight; others, familiar standbyes used successfully by generations of luthiers. Our first is definitely an old favourite: the Maples. This is a magnificent old Sugar Maple (Acer Saccharum) growing near my house. It is one of the more common trees of eastern and central Ontario. It's famously the source of maple syrup and brilliant red fall foliage, and its timber (also sometimes called rock maple) is favoured for everything from fine furniture to bowling alley floors. It is smooth, creamy white, lustrous, stable and strong (click here for the USDA data sheet on the mechanical properties of maples). This illustrates one of the most prized attributes of maple: the variety of appearances it can take. 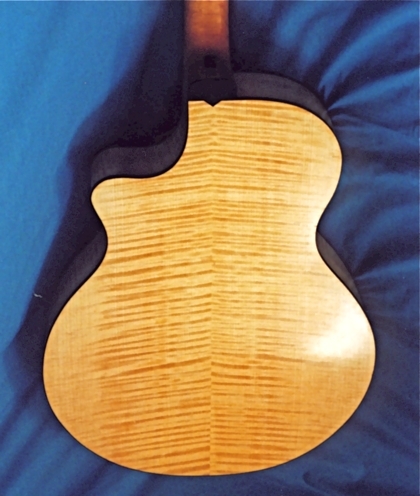 Our local maples are occasionally discovered with striped fiddleback (also called "flamed") figure. Sugar Maple is sometimes found with birdseye figure instead. These are caused by the cells in the living tree growing in an undulating pattern. When sawn, the light reflects and refracts differently from the cells depending on their orientation, creating that incredible 3D effect called "chatoyance". Spalting, on the other hand, is a natural process that can occur after the maple has been felled. If it is left and allowed to rot just slightly, molds will invade and create striking ink-black lines (or pink in the case of Boxelder) throughout the wood. Sawing and quickly drying at just the right point arrests the rot before the strength and integrity of the wood is affected too badly.